At any given point in time, in Mumbai, there are multiple eras / generations / timelines existing simultaneously in the city, in a form that DD Kosambi called the “living prehistory”. Here are ten pictures from different parts of the city (and to be fair, one has to include a few areas outside the present day municipal limits). Buddhism demanded detachment of all material pleasure. This meant settlements in natural environs like caves suitably modified to house thousands of monks. The infrastructural needs for monks were limited – a large prayer hall, various platforms for discourse, dormitories for sleeping, a common assembly area for meals and cisterns of water for all the usual ablutions. Having a river or any water body nearby was an added advantage. 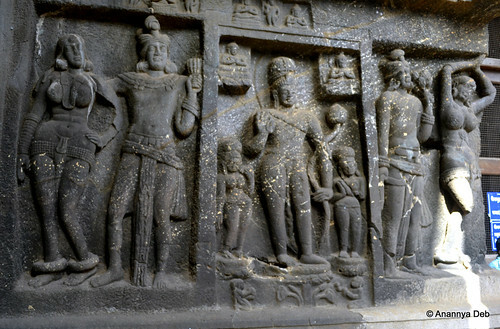 Kanheri Caves has all of these. 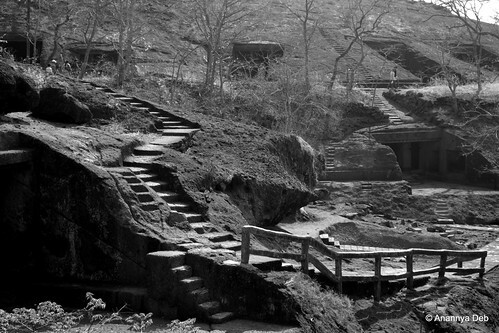 Over 120 caves are scattered over the entire hill in the middle of what is now the Sanjay Gandhi National Park. Various inscriptions on the walls of the caves date the caves from 2nd Century BC right up to the 10th or 11th century CE. The caves are located on an ancient trade route heading towards the port town of Sopara, a prosperous centre during the Mauryan era. The Elephanta Caves as a tourist landmark is quite a cliche. It’s quite boring beyond a point. I have been there three times now in the last ten years and I think I have had enough. But that is because of overkill. The sculptures themselves are magnificent. They recall very vividly Cave 29 in Ellora, also built around the same time under the Rashtrakuta kings. The original Elephant statue from the island of Gharapuri which took its name from this. The British tried to ship it to England but the crane tilted over, unable to handle the weight of the stone elephant. It was moved to the Bhaudaji Lad Museum (earlier known as Victoria and Albert Museum) in Byculla. A tourist inscription at the Banganga tank retells a story from the Ramayana. Our three protagonists, having wandered here, were resting on the hill in Bombay island. Sea water is salty. So for looking for fresh water to drink, Lakshman did the old trick – he fired an arrow into the ground. And a spring erupted with fresh water. Since the only source of fresh water known to man at that time was the Ganga, it was believed that this spring was connected to the Himalayan river, thousands of miles away. Hence, the spring was named Banganga. 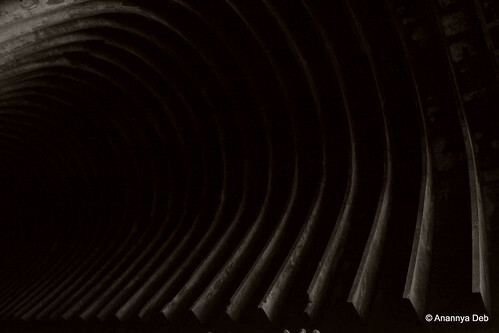 The tank structure per se dates back to the 12th century during the reign of the Silhara kings. They were the ones who brought in settlers from the interiors and soon, apart from the fisherfolk, there were all kinds of people from all the four castes doing their respective duties. The descendants of those early settlers – the Pathare Prabhus, the GSBs, etc. – are still amongst the key influencers of the city. Today, Banganga continues to house some of those ancient structures in the form of gates, pillars, the occasional memorials and inscriptions. There does not seem to be much change in the routines of the various temples. Of course, modernity has allowed for loud speakers and musical accompaniments made up of mobile phone ring tones. In this picture, like in any archaeological excavation, one can see the layers of time in the different structures – from very ancient steps to the more modern high rises. The island of Mahim, along with the other islands, came under Islamic rule for about 200 years. In the 14th century, the Sultan of Gujarat defeated the Shilharas and took over the island of Mahim. All the islands that made up the Bombay archipelago were ideal for shipping and all those involved in the west coast maritime activities tried to gain a foothold in one or more of these islands. The Sultan of Gujarat was one contender. The Bahmani sultanate was another. There was the famous Ahmad Shah (Gujarat / Ahmadabad) versus Ahmad Shah (Bahmani / Ahmadnagar) battle over Mahim in the 15th century. The Gujarat side won. In joy, Ahmad Shah of Gujarat built a number of mosques on land and on sea. Castella de Aguada was built in the 17th century by the Portuguese as a watering hole for ships (there were a number of fresh water springs here) and later as a bastion against the British who, apart from territorial victories through local battles, had taken over the other islands of Bombay following the marriage of Charles II. The Portuguese had earlier, in 1517, taken over the Mahim fort from the Sultan of Gujarat. The St Michael’s Church in Mahim dates to this period. As the seven islands of Bombay were handed over to the British, the Portuguese retreated northwards to Bandra, Malad and Bassein (Vasai) where it continued to reign for another century or so. From Dadar right up to Vasai, one can trace a whole line of extant churches built in the 16th and 17th centuries by the Portuguese. Of course, their legacy also lives in the ubiquitous vada-pav where both the potato and the bread were introduced by them. When a power establishes themselves in any place, they show their supremacy by building a religious institution. The Hindu empires built all those temples in South India; the Mughals built all kinds of mosques at various places after victories in battles or the like. The British did the same in every city they took over. St Thomas Cathedral in 1716 was the first Anglican church in India and it capped the complete control of Bombay that British now secured for themselves. The first church, a monumental one, obviously becomes a landmark. And so it lends itself to Churchgate, the railway station complex that stood outside the fort gate facing the church. St Thomas Cathedral, much renovated and repaired, is now hidden amongst the taller structures like the BSE. The two storey house originally belonging to Revashankar Jhaveri is now part of a network of Gandhi memorials across the country which includes the Sabarmati Ashram and places outside India as well. The room in which Gandhi stayed in, like all the other memorials, is arranged in the same way – mattress or rug on the floor, a writing table with paper, quills, blotting paper, etc, a spinning wheel on the side and other small stationery items. You will find this arrangement in Sabarmati, at the Aga Khan Palace in Pune, in fact anywhere and everywhere that Gandhi stayed in. Gandhi’s room on the second floor of Mani Bhavan, preserved with air conditioning. Open spaces are rare in Mumbai. So the existing open spaces have high emotional value. Shivaji Park, like similar features in other major cities, has been the hub of both social and political movements in Mumbai. While the maidans of South Mumbai are associated with the British, Shivaji Park, even though it dates back to 1920s, was always associated with, first, the local nationalist movement and later, the Maharashtra movement. Back in the 1950s, this ground was the venue of meetings and demonstrations related to the creation of the Marathi speaking state. Because of that legacy, the May 1st (Maharashtra Day) parades and celebrations are held in Shivaji Park and not anywhere else. The cinema halls of south and central Mumbai reflect the many evolutions in the city – the movement of people to the northern suburbs leading to lesser patronage, the rising inflation leading the asynchronous economics where the extant pre-independence era monthly rentals from these old properties don’t even cover the cost of a single show, the flux of soft core regional language movies which keeps ever increasing migrant population made up of taxi drivers and restaurant waiters happy. Some of these cinema halls have, of course, made their sorry state into a tourist attraction. 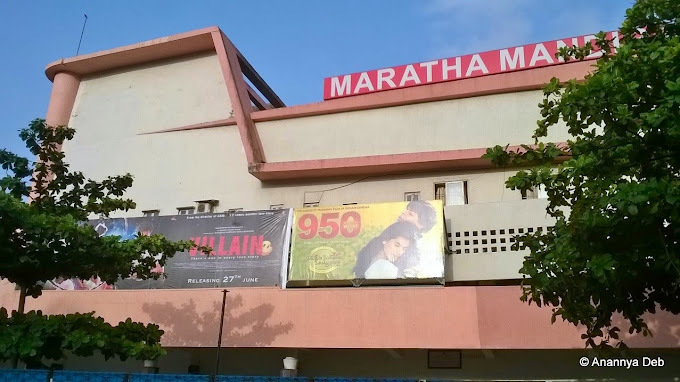 Maratha Mandir where people used to come in elephants for premieres now becomes a tourist spot for showing the same film for almost 20 years now. The recent freeing up of FSI means builders can go higher and higher. Not just buildings, even roads and transportation services are going above ground. The walled city in India can be found across the country. Their age varies from the ancient (Harappan age) to the modern (British age). But the physical walled city disappears in no time. As populations rise, people spill over to live outside the city. Walls are demolished and the city area expanded to cover the new colonies. And every now and them, some superior power comes in and conquers the city and in the process of leaving one’s mark, the conqueror will create a new walled city and the old one will either be subsumed into the new one or be simply abandoned. Delhi has had its share of walled cities and one can easily remember the dynasties that ruled Delhi by looking at the listing of all those sites. In post-independence India, the crush of ever increasing population, both through higher birthrates and even higher migrations has made these walls and gates an impediment to urban expansion and renewal. Bombay lost its walls in the 19th century itself when the British increased their holdings there. In the soot and grime of the city, these old walls look no different from the decay and dilapidation of urban housing, the only difference being that the more modern urban structures, one can say, can collapse on their own, given the quality of civil engineering and materials used these days. The old walls, however, still remain and will continue to remain till someone takes a stick of dynamite and blows them up. Remember, these walls were meant to withstand the blows of battering rams and cannon fire. The city of Aurangabad came to being in the 17th century with Malik Ambar (a most fascinating gentleman who easily fits into any rags-to-riches story template – I am gathering various literatures about him and will do a post on him and the different places associated with him) and kept evolving with interventions by Emperor Aurangzeb, the various Nizams of Hyderabad and more recently by the local city and state governments. Over this period of evolution, Aurangabad has had over 52 gates. It was not just one large walled city but a network of walled suburbs and mohallas linked to each other through these gates and bridges (puls). Off the 52 gates, there are four which are on the cardinal points. The gate facing North is obviously called Delhi Gate. In the same manner, the gate facing west (in the picture above) is called Makai or Mecca Gate. There’s a cannon fitted on top of the gate. The biggest threat to the city came from the west, the Marathas. 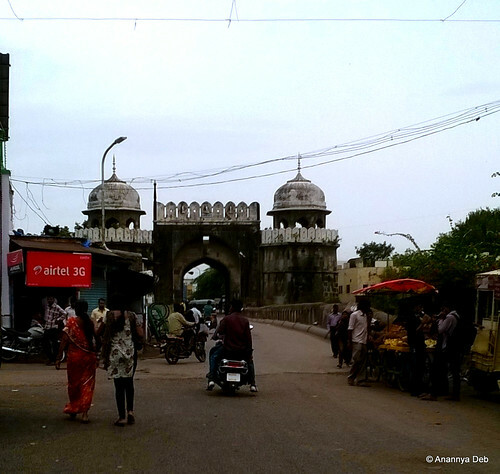 A photographic census of some of the surviving gates of the city are available in this blogpost by Neha Kulkarni (which I found through a Google search). As a traveler, the fun of visiting old walled cities is to see the shifting age. There is a clear change – in the language, the manners of the shopkeepers, the signboards, the people and of course, the physical cityscape that one gets to see. It is not necessarily cleaner, rather, in most places, it is filthier, more crowded and full of noise. One of the best places to experience this transition is to go look at the markets in the walled cities. The old signboards promising products of days gone by, their descendents doing trade in almost the same products, displayed on their shelves, each item an antique, a relic in itself. 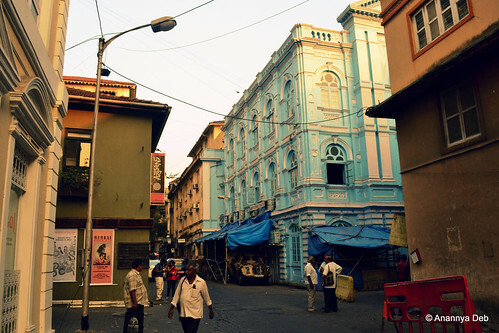 In Bombay itself (above picture), new age designer boutiques occupy the 19th century structures which have been given a nice coat of paint. Sharing a street with a synagogue which is a regular stop on the popular Kalaghoda Heritage Walk, these designer boutiques try to blend in with retro interiors, shop lighting and their display signs, all of which designed with excruciating detail. Had they been located in the more modern malls, they would obviously have taken a different approach to their shops. In the Deccan Peninsula, my favourite historical haunt, there are a number of walled cities which live two lives – Bijapur (I wrote about Bijapur’s twin identities last year), Bassein / Vasai, Hyderabad, Belgaum, Pune, Ahmadnagar and so on. 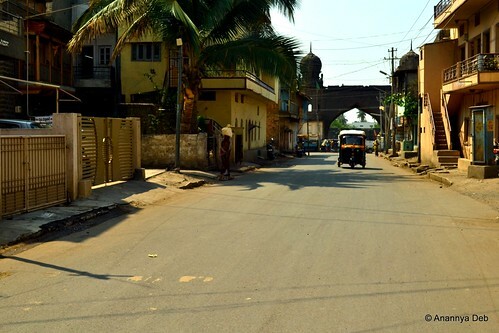 I really enjoyed exploring the old parts of Bijapur, especially streets like these – a typical gate at the end of the street and extremely quaint houses lined on both sides. While the gate in the distance is from the 16th century, the houses themselves are more recent – early 20th century – a very clear example of the continuous evolution of a city. 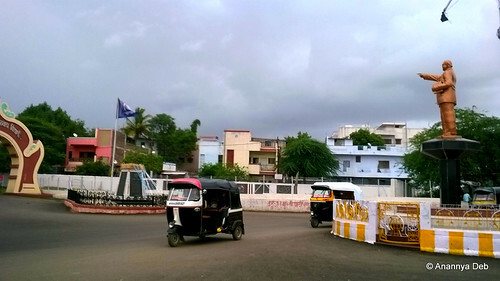 Back in Aurangabad, while walking, I came across this junction (picture below) where Dr BR Ambedkar stands tall and points the way to the university which is named after him. And on the entrance is a gate. This gate serves as a different transition point, I suppose. It takes you from the big bad world into the dreamy world of students and their lives. The 52 gates of Aurangabad does not include this gate though. But it should. There is nothing which says modern day structures cannot be considered as part of the history. In the previous post, I had written of the seclusion of the cave monasteries in Ajanta. In this post, I write about the exact opposite – the open, easily found monasteries between the Arabian Sea in the west and Ajanta in the east. As a traveler with a bias towards history, if I plot the various Buddhist monasteries of Maharashtra that I have visited on a map, there is an interesting observation that I make which, after reading various literature and historical studies, seems to have a clear explanation. These five spots, when plotted on the map, reveal that they are on two lines going east from the sea – one going North East, the other South East. They run in the same direction as two major highways which emanate from Mumbai – NH3 and NH4. The ASI informs us that this is not coincidence. In effect, there were ancient trade routes from the port town of Sopara (present day Nalla Sopara) which connected with the great cities inland include Pratishthana (modern day Paithan) which was the capital of the Satavahanas who reigned between the 3rd century BCE to 2nd century CE. The immediate conclusion is that, like the serais on the Silk Route, these monasteries were specially constructed on these trade routes and served as rest places for traders. The Western Ghats is filled with over a 1000+ such sites. And the story seems to be same for all of them. Here is an excerpt from Sukumar Duut’s Buddhist Monks and Monasteries of India. The Deccan Trap is comparatively soft. If the monks wanted retreats on the mountain-sides, the wealthy monks would not be wanting to build them. There were winding passes and traffic for the flow of internal trade and traffic. Places, not to distant from these routes yet a suitable remove to be secluded were naturally favoured. Buddhism had its golden period once Ashoka embraced and spread the Dhamma through his numerous rock edicts. As it became the religion of the people, Buddhist cave monasteries became not just residences for the practicing monks but also places which offered a number of services to the public who were of diverse background – traders, noblemen, commoners. 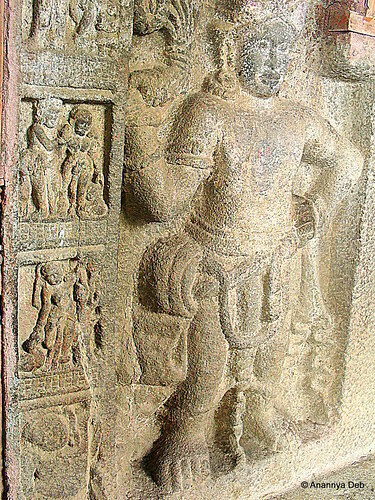 The inscriptions in the various monasteries suggest that apart from kings, wealthy traders and noblemen donated to their excavation and construction of the various viharas and chaityagrihas. In doing so, they thus sponsored the best craftsmen to conjure up all the classic sculptures and art that you can see in these monasteries. So with this in mind, one can now look at the different embellishments done at these caves and try to imagine how they may have served both the monk looking for seclusion and the weary traveler looking for rest and recreation (and some mental happiness). 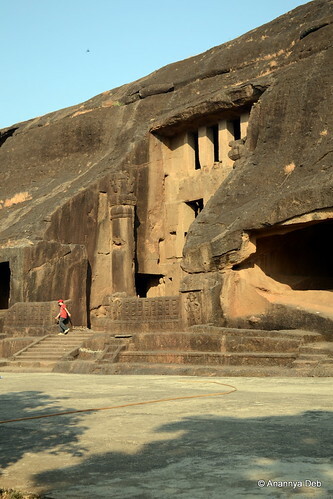 First of all, the size of the prayer hall (chaityagriha) at Kanheri and Karla are among the largest of all the cave monasteries that have been found. With a wide courtyard in front, this particular facility is well suited for large gatherings to assemble and mingle freely with ample space for everyone. For the seclusion of the inmates i.e. the residences of the monks, once you turn round the curve and go deep into the hill, you see a whole warren of caves. They are distinctly invisible from the road below and even from the main prayer hall, they require a little effort in climbing up. Thus both the needs are met. Similar concepts can be found in design of many modern day educational complexes where the main classrooms and office buildings are easily accessible from the road while the rooms for the faculty and the students hostels are hidden somewhere at the back. And what about the ornate artworks? Almost every cave has a recorded history (through inscriptions) of excavations and modifications ranging from 500 years to over 1000 years. During this period, Buddhism also saw a transformation from the more austere Hinayana to the more extravagant Mahayana where the likeness of the Buddha could now be carved out in various forms. 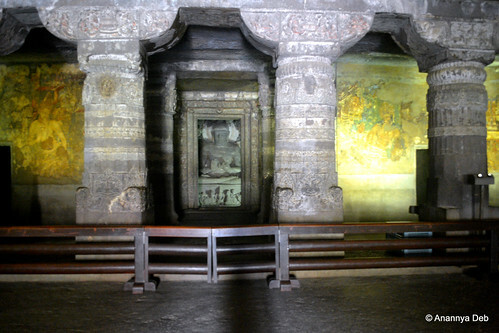 Just like the Renaissance period in art came from the need to illustrate and bring to life stories from the holy book, the Mahayana period saw craftsmen bring out the different stories, themes and ideas of the Buddha and Buddhism in stone form (and mural work in the case of Ajanta). As a history buff, making this “trail” albeit serendipitously provides a nice sense of achievement for me. Instead of randomly visiting discrete places, there is a nice thread emerging out of these visits. There are some trails which I have been following quite consciously – like visiting various imperial capitals in the Deccan peninsula and so on. But this particular discovery for myself feels good. Though it has been around from pre-historic times, the zenith of Badami’s existence was in the years bookended by the rise of the Chalukyans with Pulakesin I in the mid 6th century and the defeat of Keerthivarman in the 8th century to the Rashtrakutas. It is one of the especially fascinating places in the South, unspoiled by tourism due to bad roads and poor accommodation. And then Takeo writes about this typical scene which is best seen in the late afternoon. Ancient stone temples blend with the northern and southern mountains they are built on. Bhutanatha Temple on the other side of the lake looks like it is floating on the water. The evening view is unforgettable. It looks like a painting of India in the Middle Ages. More about Chalukyas of Badami here. 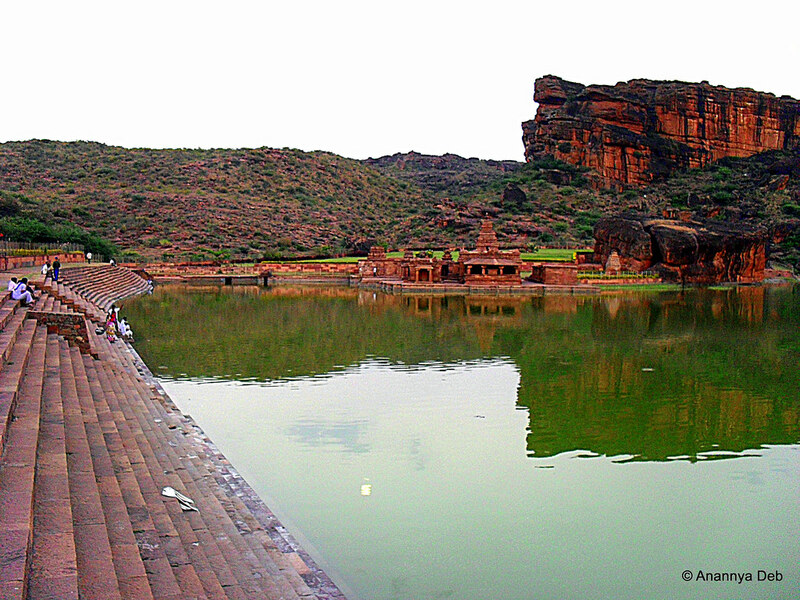 More exploration of the historic city of Badami here. The museums in Berlin, Germany can be disturbing. For example, the Jewish museum. It is life, the life of German Jews before the Holocaust. One might expect to see only the testimonies of the horrors, but most dramatic is finding yourself facing the testimony of everyday life. Laughter captured — years before the tragedy — is as painful to look at as are the emaciated corpses and piled up cadavers. The proof of those moments of happiness make the tears and pain that follow more terrifying. After a time between the narrow corridors of the place and amid its bewildering architecture, I go outside and breathe. I see spring greenery in Berlin and think: we can’t allow this past to ever return. Then, a little further, the Stasi Museum. I enter their cells, the interrogation rooms. I come from the perspective of a Cuban who was detained in the same place, where a window looking outward becomes an unattainable dream. One cell was lined with rubber, the scratch marks of the prisoners can still be seen on its walls. But more sinister seeming to me are the offices where they ripped — or fabricated — a confession from the detainees. I know them, I’ve seen them. They are a copy of their counterpart in Cuba, copied to a T by the diligent students from the Island’s Ministry of the Interior who were taught by GDR State Security. Impersonal, with a chair the prisoner can’t move because it is anchored to the floor and some supposed curtain behind which the microphone or video camera are hidden. And the constant metallic noises from the rattling of the locks and bars, to remind the prisoners where they are, how much they are at the mercy of their jailer. After this I again need air, to get out from within those walls. I turn away from that place with the conviction that what, for them, is a museum of the past, is what we are still living in the present. A “now” that we cannot allow to prolong itself into tomorrow. The plateau region in the centre of peninsular India, known as the Deccan, is one of the country’s most mysterious and unknown regions in terms of artistic heritage. Few scholars, Indian or foreign, have worked extensively in the Deccan, which remains little visited and surprisingly unexplored. It is quite easy to use “Mughal” architecture as a common label for all Islamic structures in the country, wherever they might be. It is a bit like most Indian non-vegetarian food is termed as “Mughlai cuisine”. The Islamic structures in the Deccan have a number of subtle differences. For one, most of the sultanates were descended from Persian generals and were mainly subscribers of the Shia sect. The Mughals were more mixed – Turks, Arabs and Persian – and more importantly, Sunni. Instead of looking northward for artistic influences, most often the Deccan art patrons would turn west – to Persia. The geographic characteristic of the peninsula made this region a sponge for influences from all over the world. These influences included material (e.g. tiles from Kashan in Iran) and people (e.g. Persian calligraphers). There is also a much stronger influence of Indian i.e. Hindu elements in the design and construction of the structures. So, with this basic background, when one looks at the monuments of Bijapur, there are three main observations with respect to its independent identity vis a vis the Mughals. Firstly, unlike the Mughal architecture (and specific examples would include Humayun’s tomb, the Red Fort, etc. ), the monuments at Bijapur were much more simple and to some extent drab. The Gol Gumbaz for example is a fine architectural wonder. However, there is no major detailing on the walls, the doorways, the windows, etc. For comparison, let us take two pictures, one of Humayun’s tomb and one of the Gol Gumbaz. Secondly, there is a major difference in the level of preservation / restoration work that is in place. The Mughal monuments, more high profile and much visited, obviously get the best conservationists to take care of them. The high degree of attention, in a way, drives the pressure to prioritise all maintenance of these sites. As opposed to that, the sites in the Deccan area seem to have been left to the elements. Barring the Gol Gumbaz and the Ibrahim Rauza, there was no ASI operation. The local people were the sweepers, shoe deposit counter operators, souvenir sellers and quick fix guides. As a consequence, the general appearance of most of the sites were extremely unattractive. Thirdly, and this is spoken of by the authors I quoted above, there is no definite histories of the sites. There are oral histories which have come down the years – in some cases, oral histories were recorded down in the 17th century (by the Persian historian Firishta who was specially invited by the Ahmadnagar sultan to write a history of the region, see my first post of my Bijapur series). As a result, for the same structure, different people on the ground had different stories. Ask the tangawala, he will give you one story. Ask the caretaker of a monument and he will give you another story. The available ASI literature is restricted to the technical specifications of the structure and they do not seem to be interested in speculating any further history about the subjects. 1. According to the ASI inscription, the Gol Gumbaz was commissioned by Muhammad Adil Shah in 1626, the year he became sultan. He ruled for 30 years. In 1656, when he died, he was interred in the structure. So effectively, he built his own grave. The question is why? The wikipedia article mentions some tales of Sufi mystics helping him. There are no citations. I don’t think there will be any citations on this. 2. Ibrahim Adil Shah, the predecessor of Muhammad Adil Shah, reigned from 1580 till 1627. He is buried at the Ibrahim Rauza. The local tangawala calls it the Taj Mahal of the South. (another doffing of the hat to the more famous northern cousin). He was greatly interested in music and specifically Indian music. He has written a work on the nine rasas. 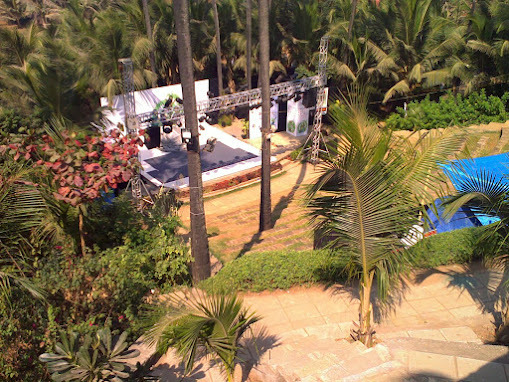 There is a structure called Sangeet Mahal in the outskirts of the city. There is no ASI inscription there. Did Ibrahim Adil Shah have anything to do with this? Is this an example of syncretism in the south. Ibrahim Adil Shah was also a contemporary of Akbar who was also dabbling in designing syncretic religions. 3. How did the people manage the heat? Here is a set of pictures on the edifices of the Bijapur sultanate? If one takes the history of the Deccan, one cannot miss out a key chapter. A period of 200 odd years spanning the 15th and the 16th century when the Deccan peninsula was the theatre of action involving two main groups – the Deccan sultanates of Bijapur, Bidar, Golconda, Berar and Ahmadnagar on one side and the Vijayanagar empire on the other side. The historical narrative of the power struggles between these two entities is quite controversial and the fact that the extant chronicles of the period are largely hagiographic in nature does not really help in understanding the matters. However, it is not difficult to discern the prosperity of the region. Whether it is Firishta’s 17th century history of the Deccan or letters written by Portuguese travelers Domingo Pais and Nunes or the various temple inscriptions, this whole area was rich. Robert Sewell’s A Forgotten Empire integrates all these varied texts into one cohesive narrative. The legacy of these 200 years is a unique culture in the Deccan – there is a juxtaposition of two sophisticated cultures – the Islamic Persian – Turkish and the Hindu Sanskrit. In everything – the architecture (of the past), the cuisine (still actively consumed today), the language, the names of people, etc., all reflect that. For travelers, there is an entire world of experiences sitting here. But, there is a vast area to cover. I did a five day trip to two of these spots – Bijapur and Hampi. In the next few posts, I will take up some of these experiences. In the meantime, photographs from the trip are on my flickr photostream.